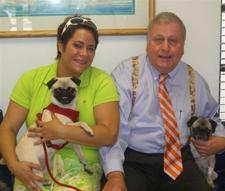 Jessie and Jeff Thompson were introduced to Marcia early in 2008 by an interested third party pug lover. They had spoken many times about adoption since they had the perfect large fenced and walled yard for dogs. The Thompsons at this point had a pug, Lucy Liu, a Jack Russell, Daisy, and two Bassetts Bailey and Cody. Cody had been adopted so they were aware of what it is like to adopt a formerly mistreated animal. Marcia had recommended that Jessie and Jeff look at a new member of Compassionate Pug Rescue, a beautiful little girl named Baby Girl. On April 23, Jessie and Jeff lost their precious Jack Russell Daisy at the age of 11 to bladder cancer. Grief stricken for weeks they entertained adoption of a pug and spoke to Marcia about Baby Girl. She was brought over to the Thompson house for an introductory visit and to meet her potential three new sisters. It was love at first sight for everyone and two weeks later Baby Girl became a Thompson. Jessie and Jeff had her palate corrected and her nasal passage widened surgically so she can now play pretty hard with her three sisters and is very very happy at her new forever home. She sleeps on the bed every night – loves all her new toys – can now breathe just like a regular pug – has put on weight enjoying all new food and is absolutely one of the best things Jessie and Jeff ever did for themselves. They thank Compassionate Pug Rescue for giving them their wonderful new pug- baby Girl!